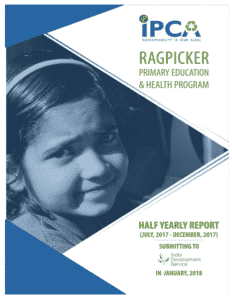 A few years ago, IDS funding helped establish the Ragpicker Primary Education and Health Program. Although IDS is not currently giving financial support to this project, the Indian Pollution Control Association (IPCA) has kindly sent us a report covering the last six months of 2017. We are pleased to see that this project has become strong and resilient on its own. For example, in late 2017, the ragpicker community at Sarfabad was forced to resettle elsewhere, causing one of IPCA’s primary education centers to close. Despite this challenge, IPCA is working diligently to secure the proper infrastructure and hire a teacher so that the center can be re-opened. Click here to read the report, which includes photos of activities at the centers and statistical information about their operation.